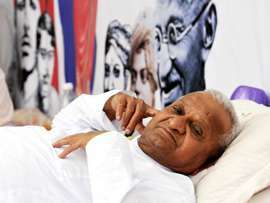 Prime Minister Manmohan Singh has urged the anti-graft campaign leader Anna Hazare to end his fast. He through his letter has assured of considering the Jan Lok Pal bill, prepared by his team to eradicate the corruption from the system. “Over the last few days, I have watched with increasing concern the state of your health. Despite the differences between the government and your team, I do not think that anybody is or should be in any doubt about the deep and abiding concern which I and our government share about your health, arising from your continuing fast. I have no hesitation in saying that we need your views and actions in the service of the nation, from a robust physical condition and not in the context of frail or failing health. “I have maintained that your and our object is identical viz. to reduce significantly, if not eliminate, the scourge of corruption from this country. At worst, our paths and methodologies may differ, though I do believe that even those differences have been exaggerated. The government is committed to passing a constitutionally valid and the best possible Lok Pal legislation with inputs from Civil Society with the broadest possible consensus. We are ready to talk to anybody. However, we will have to keep in mind Parliamentary supremacy and constitutional obligations in matters of legislation. As a government we respect and are responsible to the Will of the Indian People as represented by Parliament. “As you are aware, the Lok Pal bill is now before a Standing Committee of Parliament. I have made it clear earlier and would like to restate that all options are open before the Standing Committee. Undoubtedly, they would be entitled to consider, in detail and clause by clause, subject to their discretion, not only the Bill introduced by us but the Jan Lokpal Bill and other versions like those prepared by Ms. Aruna Roy. Equally, I do maintain that they are fully entitled to make any changes to the Bill introduced by the Govt. and referred to them. In that view of the matter, the formal non introduction of the Jan Lokpal Bill version by the government is irrelevant and would largely boil down to a semantic debate. “Nevertheless, in view of the concern repeatedly expressed by your team that the Jan Lokpal Bill version should be before Parliament, but more particularly and more importantly, in view of my deep and abiding concern for your health, our government is prepared to request the Speaker, Lok Sabha to formally refer the Jan Lokpal Bill also to the Standing Committee for their holistic consideration alongwith everything else. Furthermore, if you have any anxieties about time and speed, the Government can formally request the Standing Committee to try, subject to its discretion and the necessity to reflect deeply and spend adequate time on an important Bill, and fast track their deliberations to the extent reasonably feasible. “I would like to say that this letter and each suggestion herein is actuated solely by the twin considerations of deep and genuine concern about your health and the emergence of a strong and effective Lok Pal Act in accordance with established constitutional precept and practice. कांग्रेस प्रवक्ता मनीष तिवारी का कहना है – राजनीती मैं ऐसी अनर्गल बातें कहनी पड़ती है . प्रणब मुकर्जी कहते हैं – अनशन अन्ना का सरदर्द है . अडवाणी जी कहते हैं – भ्रष्टाचार के मुद्दे पर अन्ना और उनके समर्थक भावुक हैं जिसकी वजह से ये जिद पर अड़े हैं . आज हमें ये सभी लोग सोचने पर मजबूर कर रहे हैं की भारत की १२५ करोड़ जनता ,जिन्होंने इन लोगो को वोट देकर संसद में भेजा है मुर्ख हैं जो इनके और इनके जैसे सभी पार्टियों के घोटाले चुपचाप देखती रहे और चुप रहे ,अगर आवाज़ उठाई तो बाबा रामदेव जैसा हाल होगा .